IZERUO Pinpointer is a handheld metal pinpointer with high sensitivity. It can work in door, on sand, lawn, in soil. It can detect various types of metal object, such as coin, gold, silver, relics, jewelry. The pinpointer is powered by one 9V alkaline battery (6F22, not supplied). To install the battery, please first turn off the pinpointer. Remove the battery cover. Then install the battery and recover the battery cover tightly. (1)Dispose the old battery properly. When you recover the battery cover, please secure it properly. (2)When the flashlight blinks, change the battery. Press POWER ON/OFF button to power on the pinpointer. The flashlight lights, green LEDs blink and buzzer sounds starting initialization. After about 2 seconds, LEDs stops blinking and the buzzer does not sound, meanwhile the flashlight keeps lighting. Now it is ready for operation. When the pinpointer detects metal object, the first green LED lights. Meanwhile it sounds and vibrates. As it slowly approaches the target, the second and third LEDs light respectively. At the same time, it keeps beeping and vibrating. Repress the POWER button to turn off the pinpointer. (1)The pinpointer will suspend the operation after continuous detection above same target for about 10 seconds in order to save battery power. At this time the flashlight keeps light. Will recover the detection for new target after about 1 second. (2)When the pinpointer is in initialization, hold the pinpointer stable and keep away from any metal object. (3)The pinpointer is not waterproof and can't be used in the water. Handle the pinpointer gently and carefully. Dropping it can damage circuit boards and cases and can cause the pinpointer to work improperly. High Sensitivity & Widely-used - High Sensitivity for improved detection of small targets. Apply to many occasions such as indoors,outdoors,on sand,lawn or in soil,locate coin, silver,jewelry and gold with speed and accuracy.Three sensitivity levels with different LED indicators light,audio and vibrate alert. Compact Size - Small size pinpointer with holster, more portable and convenient. 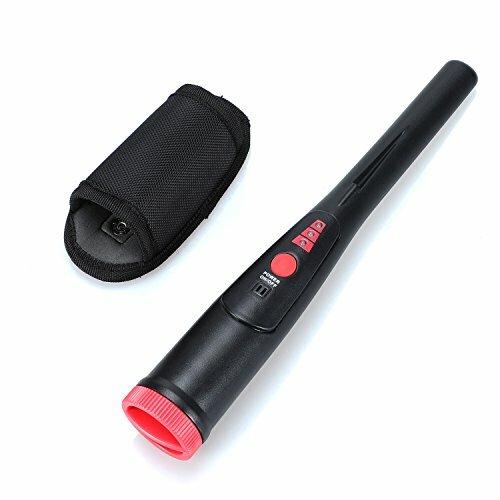 Battery Saver - The pinpointer is powered by one 9V alkaline battery,the pinpointer will suspend the operation after detecting the same target for about 10 seconds. Simple Operation: Single-button operation, allows user to quickly turn out the detection, without having to step through multiple sensitivity settings. More Safe Guarantee with IZERUO: 45 days money back and 12-months warranty and professional after-sale service within 24 hours. If you have any questions about this product by IZERUO, contact us by completing and submitting the form below. If you are looking for a specif part number, please include it with your message.